Strong reactions have erupted after far-right wing politician Geert Wilders was found guilty of inciting racial discrimination against Dutch Moroccans in a court on Friday. 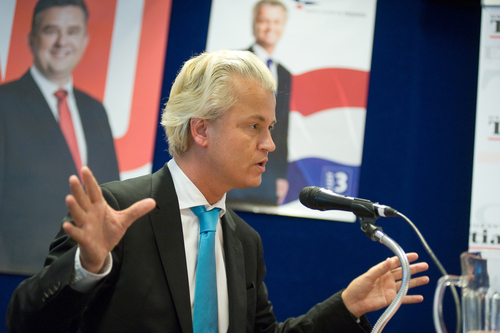 Wilders was condemned for his actions leading a PVV party rally calling for ‘fewer, fewer’ Moroccans in March 2014 – and now has a criminal record – but he received no punishment from the three judges. But prime minister Mark Rutte told his weekly Friday press conference that ‘The Netherlands is not sick…[but] a constitutional democracy’, according to NOS broadcaster. He added, reported the Telegraaf, that his Liberal VVD party will not work with the PVV in a new government unless Wilders withdraws his ‘fewer Moroccans’ statements. The criminal court case was based on almost 6,500 official complaints after Wilders asked a televised party rally in The Hague on 19th March 2014 if there should be ‘more or fewer Moroccans in the Netherlands’. The court heard that a pre-arranged chant of ‘fewer, fewer’ had been seeded through the crowd. At the court itself, representatives of the people whose complaints fuelled the case, were happy with the verdict – which did not award any damages and said both sides must pay their own costs. Wilders’ criminal record is not thought to preclude him from being a politician but might limit his travel abroad. Wilders was officially charged with defaming a group and inciting racial discrimination, but was found not guilty of a charge of inciting racial hatred.